THANKS EVERYONE, THE CLUB IS NOW FULL FOR THIS ROUND. ‘Farm wool’ is wool that is pretty dang close to the farm. That means that the money I spent on this wool goes to the farmer and small mill where it was processed. Farm wool also means that you may find a stray piece of vegetable matter (vm) or two in your wool ;) personally, I find that all the more charming. Like the Falkland, Farm wool, has not been through the chemical acid bath that commercially processed wool goes through. This wool should also be slightly softer and retain more character and lanolin than its commercial counterpart. I promise you that spinning farm wool will be totally different than commercial top! Why is this more expensive than the falkland club? Farm wool costs more than commercially processed wool, but it has also had much more care in the preparing of it. 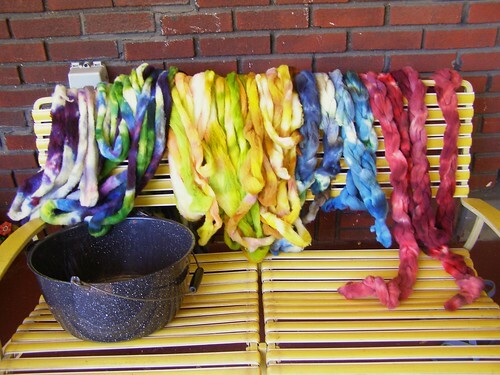 Because farm wool is so fluffy and newly processed, it is more difficult to dye and often needs to be dyed in smaller batches and so it takes more time to dye. Each subscription to the fiber club lasts 3 months (in this instance, April-June). You get 4 oz of farm wool in an exclusive cosymakes colorway, hand dyed by me with Greener Shades Professional Acid Dyes*. the first is from a farm in ohio who i’ve bought from before. this is probably their last year, since they are moving on from farming and have gotten rid of their goats. the second is a fleece i fell in love with at the fleece sale at Maryland sheep and wool, and had processed. it will want to be spun thin, i think. the third is also from a fleece from maryland – and when i say long staple, i mean corries are often sheared twice a year and this one was only sheared once! *I dye using greener shades dyes. they are low impact heavy metal-free dyes. 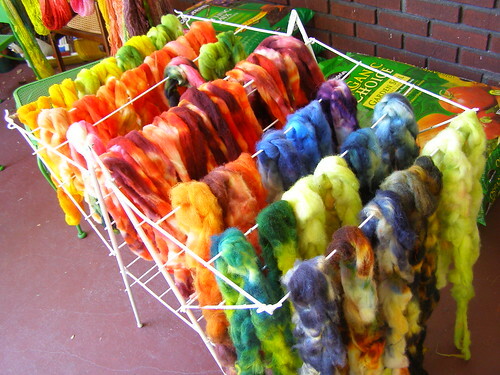 All but the teal meet the Organic Trade Association’s requirements for organic fiber processing. This entry was posted in cosyknitsliterally, cosyspins, dyeing, farms, fiber club, handspun, spinning by cosymakes. Bookmark the permalink.